Forgive me in advance if the lines get blurred between me being a journalist and someone who is pissed off about a misjustice that is occurring right now in Franklin, but this is a difficult one. 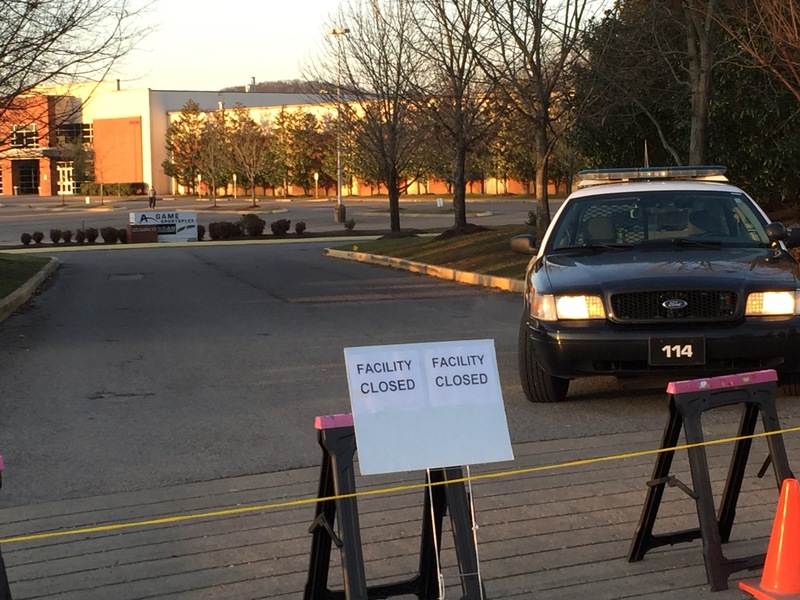 The owners of A-Game Sportsplex closed and locked the doors to their facility this morning. The police are in the parking lot blocking the entrance. The sale and eventual closing of A-Game has been well publicized the last few months. But now the owners have decided to do the worst thing possible and that is use children as a pawn in their business dealings. The thousands, that’s right thousands, of children who play volleyball and hockey at A-Game now have nowhere to go. There is a month or so left in the seasons. The volleyball and hockey clubs who operate out of A-Game have valid leases that extend beyond this season. The owners are attempting to force them out of those leases by locking the doors. Oh, and there is a school that operates in A-Game. Sorry again kids. A statement today submitted by the ownership group said that they will work with the lease holders to reopen the facility for the remainder of the season, but only if the volleyball and hockey groups agree to terminate their leases early, thereby enabling the owners to sell the building. I just put two kids on the school bus this morning. One of them is expecting to return from school and have a practice at A-Game tonight. The other, whose team I serve as head coach, is supposed to practice tomorrow night. How do you explain this one to them? They don’t cover this one in parenting school. Including A-Game, there are only six sheets of ice in Nashville that can be used for youth and adult hockey. There isn’t a lot of available ice time at any of these six as it is. Closing A-Game and taking two sheets of ice away in Nashville will be devastating to a market that was on such a high after this past weekend’s All-Star game festivities. Just building a new rink is not something that can’t occur quickly. Business is difficult, but when you involve children and use them like the owners of A-Game are attempting to use them, it crosses a line. The volleyball and hockey players of this community do not deserve this. It is in no way their fault yet they are be the ones who will suffer the most. The local economy will suffer as well. A-Game hosts volleyball, basketball, and hockey tournaments every weekend. That means hundreds of hotel nights and restaurant meals that could disappear. A significant number of Nashville Predators season ticket holders live in Williamson County. Fewer people playing hockey there, children and adults alike, will not be good for the Predators either. Stay tuned for further developments in this ugly situation. ← Hilary Knight helps sustain growth of women’s hockey in the U.S. Thanks for the story. This is a difficult situation and I am horrified that the ownership would do something like this. I have been playing, coaching and refereeing at agame for nearly 15 years. I thank the hockey gods that my son is a Sr in high school and has been able to complete his last year of competitive hockey without this drama effecting him. He apparently played his last game at AGame last night. The kids that I see every Sat calling games are the ones that feel for. Thanks for expressing how I feel. I, too, will have a hard conversation with my volleyball player this afternoon. She will be devastated. Thanks for expressing how I feel as well. Wish the individual names of the ownership group were made public. Not that I wish anything bad to them, but I do feel they hide behind the ownership name and they should be publicly recognized for the hurt and pain that they’re causing with their legal tactics! The greed is appalling. The treatment of kids is worse. The owners of A Game also put on (own) 7-8 volleyball tournaments per season. The fees for these have already been paid to Agame by dozens of teams, many of whom are coming from out of town. For this weekend’s tournament, there are teams coming from Chattanooga, Memphis, central Alabama, Georgia, and Missouri. These families have all paid for the tournament, and made hotel reservations. I am pretty sure taking someone’s money when you know you won’t follow through is fraud. This is terrible news for your kids and town!!! How can they take that away from kids. The owners should be made to honor their existing agreements. We are scheduled to be there next weekend the 13th and the 14th from Detroit. The ones closing this facility… We should all know and remember their names! Thanks for your article! I worked there four years and know firsthand how much A-Game means to that area. Besides the volleyball and hockey tournaments, A-Game hosts national basketball tournaments. $40 million plus dollars in hotel and restaurant revenue will be hard to replace. Many of the people in the hockey department have been there almost 20 years and they have put their blood, sweat and tears into A-Game. It’s a very sad day. I am an employee there and I just want to say that probably 95% of us were kept completely in the dark about how this was all going down. I went to a staff meeting YESTERDAY with one of the owners and we were told to proceed as usual. I read the news report this morning, and contacted a manager. I got a response about 3 hours later saying to not come in for my shift tonight. I’m a shift supervisor. I wasn’t even alerted until I reached out first. Ridiculous. Everyone is hurt by this. On behalf of the staff that didn’t see this coming, I’m really sorry kids and parents. I wish I could have been part of a company that served you with more decency. Thank you for thinking of others as you also scramble yourself on such notice! We have enjoyed the facility and especially the pleasant staff. Great things will come from this unexpectedly I believe! Alyssa Ivey at A-Game Sportsplex. I am crying as I write this post because I wish people could know the truth. Unlike the tenants, the owners of Agame and I being one of their daughters have waited to make a post or statement about the whole ordeal because we have tried our best to handle the situation with fairness. Through all of this the owners have chosen not to interview with reporters and to not tell lies about the situation therefore it’s a one sided story. For all of you that have been making naive postings about how your children’s life has been taken away due to the “owners inflating their bank accounts, or not making enough to profit”… No that’s not at all how this went down. Who do you think had the vision, the love, the desire to start this company 15 years ago on our kitchen table designing a layout to give all of the community and your children the opportunity to play sports and have entertainment at the best facility in the world, my dad did. He waited years and never gave up until he found enough money to start this for you all. He put his entire life on hold for Agame. Trying to improve it every day. Every day I came home for years and years he was planning something new for Agame or simply going to work the front desk for tournaments because he wanted to. You think he would give up that easy if he just wasn’t making “enough”, definitely not. But he isn’t the only owner that did this, and those owners have families too. What would you do if your business was losing thousands and thousands of dollars every year and putting your families future at risk and taking all of your happiness away. Well surprisingly no the owners didn’t just wake up and say hey let’s sell this company and inflate our bank accounts. They tried for months and months going to the county, the state, different buyers, anyone who would take the challenge at keeping this a sportsplex for YOU. But after the state said no its losing money, the county said no it losing money, and no buyer could take on that challenge yes, they decided to try and sell it because that was the only option that made sense. It’s sad to me because you all act like your life is over, and these owners are monsters, but little do you know how this has strained our family, how Christmas this year was filled with silence, and how many lifelong friends have turned their back on my family. It has hit us HARD. And guess what, I guarantee you my dad and I have spent more hours in Agame than any of you, that place was actually our 2nd home, I was there the day we started construction to make this community a better place. I got in fights with my dad begging him not to sell but then I learned of the situation and had to accept it was best. Some good things eventually have to come to end. I know that all the ignorant posts from people obviously don’t know my dad, because if you did you wouldn’t make those assumptions and post and send hateful things that hurt. He amazes me every day as do all the owners with the amount of respect they give others. My father has never missed a game since I was 5 years old, and I just finished my last collegiate volleyball game for Auburn and have played every sport in the book. He is the most loving, dedicated, understanding, intelligent, compassionate father, husband and owner you could imagine. He has always taught me to be kind in every situation. So please know the facts before you post thinking solely of yourself. Because yes, this HAD to happen, yes the court ruled Agame needed to shut down, yes the owners gave employees a notice, yes we tried everything to keep it a sportsplex, yes we did everything for this community that was possible. Without these dedicated owners the facility would have shut down years ago. I love you so much dad and continue to keep your head up!!! You did an amazing thing for this community, they were spoiled by you and the other owners hard work, and thankfully Nashville is blessed enough to be able to move on from this once they finally can see the big picture. If your kids love sports as much as you post about then you will find a way to love that sport without Agame. I miss you and wish I could be there with you through hard time this Daddio. Thank you for all you have done for me. I will always strive to have your patience, your kind heart, and your ability to view every situation in the most positive light, you are my hero. A-Game Sportsplex. Share to support the amazing time and experiences we had with this facility and the love and hard work put into it. Out with the negativity. Probably should have left out the “Daddio” part. So we’ve heard there were other offers on the table and those planned to keep the place running as a sportsplex, is that true? If your father/other owners cared so much for the kids, why did he close the place with all their school supplies and hockey/figure skating equipments inside? Why not allow them to finish the season at least? Why weren’t employees told about the closing? Your father and the other owners acted in the worst way possible and Deserve the same. A man of integrity would never have done something like this. Your daddio sounds like such a great guy so I’m sure he will have no problem with providing full refunds to me for the 3 nonrefundable airplane tickets we booked for next weekend’s hockey tournament. You are so full of crap I can smell you from New Jersey. Twist it any way you want, ALL the owners care about is profit. IF what you say is true…which I don’t believe for a moment…then where are the refunds people should be getting? Where is the common courtesy of letting people, especially the employees, know what is going on BEFORE the facility shuts down? I’m sure your tears mean a whole lot to the people who the owners screwed with no regard whatsoever. And yet, having dealt with this ownership group in the past, I don’t find this the least bit surprising. No they did not give employees notice. I will say I DO appreciate the hearts of the owners. I really TRULY believe they meant right, and I personally don’t disagree with the closing. But to just show up without having one single warning is so hurtful too. Having worked with and met only 2 of the owners, I do believe wholeheartedly that they tried their hardest to keep it open. But they were dishonest with me to my face when I asked if I would be okay and they said yes. No one should give in without a fight and end their season early! How about the kids that give up two days a week to practice and weekends for tournaments. Their parents gave up their time and money for them to be able play. Many hope that they might be seen by college scouts and receive a college scholarship. I have two daughters that played both high school, club and college volleyball. Both received college scholarships. None of that would have been possible if they didn’t have a place to play club ball. In college, my daughter’s coach encouraged all players to coach a local club team, so that they could encourage other teens the importance of teamwork, commitment, respect, determination, and to never give up on your dreams. To this day, my daughter has coached club volleyball every year and loves to be able to give back to the community what it gave to her. She, and her team/club, are devasted about this situation. These kids are balancing school, sports, home life and, are having a positive impact in the community. Our kids and coaches don’t deserve this! Please reconsider and honor the leases YOU made them sign! I’m sure your father did great things for the community throughout his life. I think every community needs a complex like Agame and employees to run it as well add they did. But calling these parents naive,idiots and spouting what great qualities “daddio” has, does nothing for your argument. In life, you will learn, that all your greats deeds can be erased with one great deed! Your daddio and his partners just did that. Instead of covering the losses (which they caused themselves),for the final month or so on the leases, they shut the doors! Instead of taking on the loss which is their responsibility, you now of caused hysteria and additional cost to the parents that doubles or triples that 80k loss. That alone, has erased every good deed they have done. They new the risk of the business and incurred that loss for months and your telling me they threw away everything they worked for (not Agame, I’m talking about throwing away the respect of the community, not just Franklin but the entire southeast US), to save an extra 80k! By the way, I’m thankful we don’t have to play there the rest of the season. I’m just furious a group of 4 human beings would do this to their employees and to the community. You do not have my sympathyand neither does “daddio”. But all the people that have been screwed over by these 4 pieces of scum, have it! Last week there was a hockey tournament and a volleyball tournament… I don’t know about the volleyball people but the hockey tournament brought in lots of money for the Franklin community: 210+ hotel rooms, lots of restaurants’ eating, lots of people spending their money at the mall. This coming weekend another hockey tournament but it has to be cancelled because of the selfishness of 4. Hotels and restaurants will feel the burn too. Very sad! Wow. News of this situation has reached all the way up here in Pennsylvania. I have never been to A-Game, or even to Nashville for that matter, but as a parent of a young hockey player, I cannot even imagine what some of you are going through. How exactly does one discuss this with their child? It truly is an injustice against humanity when children are affected by the greed and carelessness of people such as this. To all those who have been affected by these people, we feel for you and offer encouragement that something good will come of it. This is on behalf of all of us in the Delaware Valley area. To the owners of A-Game: Your names are now known nationwide. Don’t expect to be treated with any kindness. This facility is a private business (not a taxpayer funded facility) that has been for sale for years because it does not do well financially. Any of you were free to form a company to buy the facility if it is such a great business. The city or county could’ve purchased it as a recreation center and chose not to do so. It is sad that it is closing and of course it is terribly disappointing to the kids but the personal and threatening attacks are way over the top. The business would have closed years ago if the owners had not continued to pump money into it trying to keep it open. We all face disappointments and the timing is unfortunately but a judge has already turned down a legal motion to force them to stay open. For people out of state to make threatening remarks about reputations and greed without even being privy to behind to scenes information, what are you teaching your children about handling disappointment with a dignified attitude? People should not rush to judgement unless they were actually behind the scenes and involved in the years of discussions trying to find a positive resolution to an unprofitable business venture. As a business owner myself, you never take money you don’t deliver on. You know when you owe someone. It does not need to be written on paper, you just know when you owe people. The 4 owners know they have taken money for upcoming tournaments. They knew before the doors locked they were not going to deliver on these commitments. How can they sleep knowing they just screwed people they made a promise to. They signed contracts to hold tournaments which they could have cancelled and returned money months ago. This is complete dishonesty. I would sell everything I owned before I would take money and not deliver. No wonder they never made a profit, bad financial decisions don’t happen over night. I hope they see the light and make good on the money they owe good people. Sounds like the protests worked. A-Game should definitely reopen so kids can finish their seasons and remaining tournaments can become held. Tenants can get their money for damages. Hopefully, Parents can get refunds if warranted. A Game employee here. Still have not received a single text, call, or email to either a.) relieve me from my position so that I can look into unemployment or b.) give me even one shred of an update or a thank you or a sorry.